I have made a form using jotform. There are some questions in this form. When the user first goes to the page, there is only one question. This question is a radio button with 3 options. Depending on which option the user picks, some other questions show up. Why are you interested in acting? Have you ever taken an acting class? Can you write interesting stories? Now the form is ready. I have included is as a script on my website. BUT the only problem I am having is when the user goes to the page, for just a second, the entire form shows up with all the questions. Then, all questions disappear except the first one. Is there a way to fix this? I have also tried iframe, same problem. Can you please share to us the form you are working on. We can check the form too. Please state the form's ID#. when the form is on its own page without anything else, this doesnt happen. This only happens when I include it on my website. I did exactly what the instructions said, copied/pasted the code in my html. Thank you for speedy update. Unfortunately, I could not check your form or the website where the form was embedded because I could not determine even your username (as you can see on your post you are guest_22918599219064). Can you give share to us the URL of the website where the form was used/embedded? The info will help a lot in checking the issue. Sorry about that, I am not sure why my name did not show up, perhaps it's because I cleared my cookies. Actually, I just noticed another problem. The form works in Firefox and IE, but it does not work in Chrome. When the user picks any choice, the rest of the form is supposed to show up. But in Chrome, when someone clicks on any choice, nothing happens. The rest of the form does not show up. PS I can send my CSS file, or anything else that you may need. Would it be OK if you used the iframe code instead? OK, I have embedded it as an iframe. I think I was mistaken when I said the form works if it's alone (not embedded). Meaning, even if I go to jotform.com/forms/FormID, it does not work in Chrome. As you can see, even with iframe, the form looks messed up. This is how it appears in Chrome broswer. It seems that the cause of this are the shrunken texbox fields. Since they are initially hidden by default (using Show/Hide conditions. ), when the selection triggers the show fields, the fields would overlap each. Please check this form https://www.jotform.com/form/22945751314959 . It is a clone of your form, I just remove the submit button and emails. It does not overlap anymore. 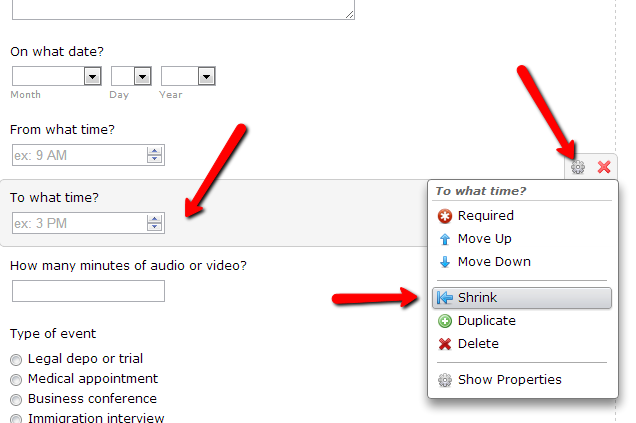 Please try adjusting the expand/shrink property of the forms and page. Inform us if this work. Thanks, I will try that. By the way, I was going to provide an additional piece of information, maybe this will help. This form was originally a dropbox form. I went to jotform.com/dropbox and generated the form, then added some fields to it. Could that be the reason it got messed up? Maybe I am not supposed to modify the dropbox form? We can be sure that altering the dropbox integrated form, had nothing to do to the anomally. if you alter the dropbox integrated form, it will only break the integration and may need to be re-integrated. But it should not distort the form the way it did on your current form. It is common that forms are being re-used and recylced for differnet purpoases. As good practice though, always clone your own form before doing major revisions so you can alwasy have the previous versions stored. 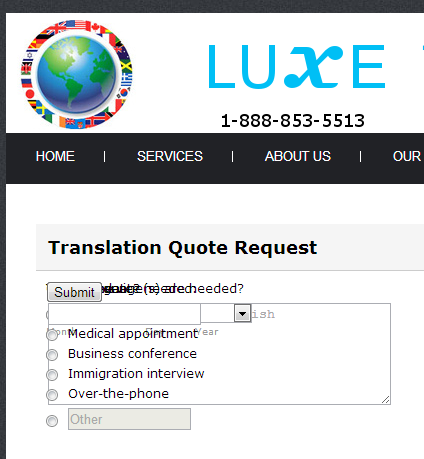 Please inform us if the issue persist on your current form. "I just removed the submit button and emails." I know you removed the "submit" button, but what do you mean by "emails"? I also don't understand this: "Please try adjusting the expand/shrink property of the forms and page." What do you mean? "I just removed the submit button and emails." for the notification email. "Please try adjusting the expand/shrink property of the form fields and page." Try not to use the 'shrink' property on some of the fields, spcecialy those that you used on the Show/Hide condition. I'm sorry to bother you, but it's just not working. I think you have correctly narrowed down th problem to the Submit button. After some trial and error, it seems that if the submit button is not included, the overlapping problem does not happen. Right now I am also having another problem. Sometimes, when I select a radio button, nothing happens. additional fields do not show up. I am really not sure what to do at this point. Please clone this form http://www.jotform.com/form/22947297152966 instead. Then embed it on your website. Use this guide How-to-clone-an-existing-form-from-a-URL. Let us check afterward if this sorted it out. Thanks so much. I am not sure what you did there, but it seems to be working. Do you mind sharing with us what you did? As mentioned already, I only altered the property of 2 fields... "From what time" and "To what time"
They where both in shrink mode previously, so I expanded them. If you noticed on the form they are not side by side anymore. They are in 1 column instead. You can experiment on your end. Feel free to contact us anytime should you require assistance.